Ferrari: hybrids are the future | What Car? Ferrari says it's pushing ahead with its first production hybrid car, but has dismissed electric cars because they won't reduce pollution. Ferrari chairman Luca di Montezemolo told the BBC that his company was 'working very, very hard on the hybrid Ferrari'. 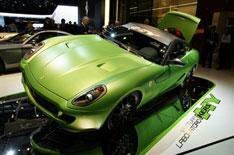 In 2009, Ferrari unveiled a 599 Hybrid at the Geneva motor show, but the company insisted the car was merely a test mule, showcasing the technology rather than representing a production-ready model. The company also says the Kinetic Energy Recovery System (KERS) that's used on Formula One cars will soon be fitted to its production cars. However, don't expect to see an electric Ferrari. 'I don't feel electric cars represent an important step forward for [fighting] pollution and CO2,' Montezemolo said.